The HEXUS Epic Giveaway is back and bigger than ever! In partnership with Stormforce, we are giving all our fabulous readers the chance to win fantastic prizes every day throughout the holiday season! Our awesome giveaways will feature goodies from all your favourite tech manufacturers, including AMD, Asus, Corsair, iiyama, Nvidia and Razer. It's going to get hectic, so be certain to bookmark our dedicated Epic Giveaway homepage to keep tabs on each new competition as it arrives. On Day 14, we're giving you the chance to win some splendid gear from German cooling expert be quiet! 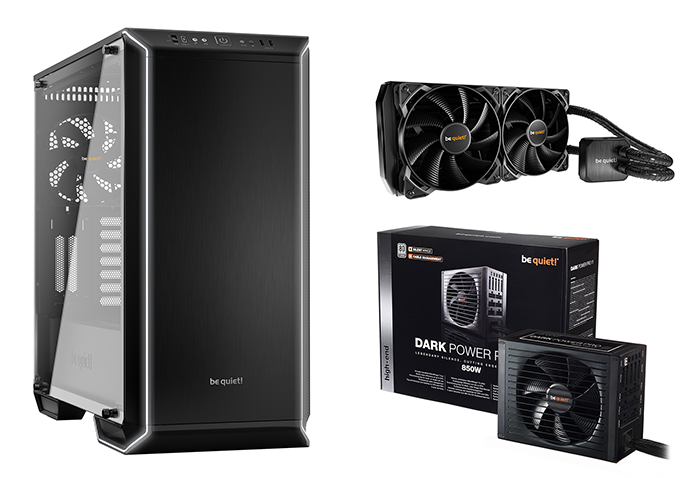 The winner will bag a lovely Dark Base 700 chassis, Dark Power Pro 11 850W PSU and Silent Loop 280 liquid cooler. Want to be in with a chance of winning? Answer the following question, and don't forget, you can also claim a free second entry via Facebook. Good luck and check back soon for more prizes in the 2017 Epic Giveaway! The competition winner will be picked at random from all eligible entries that arrive by 09:00 London time on the closing date, December 31, 2017. The winners will be notified via email by January 15, 2018. The winner must claim their prize within 7 days of the promoter sending notification. If the prize is unclaimed after this time, HEXUS reserves the right to offer the unclaimed prize to a substitute winner selected in accordance with these rules. The prize is a be quiet! Dark Base 700 chassis, Dark Power Pro 11 850W PSU and Silent Loop 280 cooler. Many thanks to Hexus and Be Quiet.